High school senior Angie isn’t usually a secretive person, but when her idol launches a songwriting competition which her mother forbids her from entering, Angie decides to do it anyway. It’s not like her mother’s the most honest person—for one, she never speaks about Angie’s absentee father. The thing that intrigued me most about this novel, is the incorporation of music. I love a musical context in stories – although that doesn’t always turn out so great, but still – and that’s what made me pick this one up! There is one thing I have to add, though. As you might’ve noticed, this book won’t be published until Spring 2020. The author – Olivia Wildenstein – got picked up by Swoon Reads, which means her book will be published! I’m pretty sure she put Harshville on NetGalley before that happened, which is how I already got to read it. 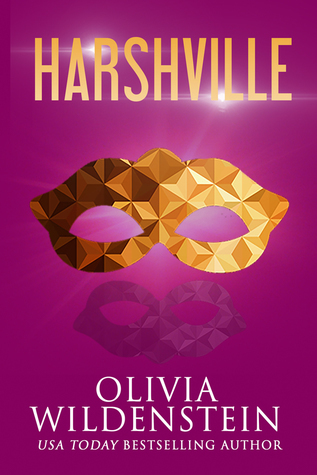 Granted, there’ll be plenty of changes, but I got Olivia’s agreement to publish my review anyway! I could hardly let it sit in my drafts for over a year, right? Not to mention the changes Harshville will have been through by then! I needed something fluffy to read and this was pretty much exactly it. There are some heavier topics mentioned – a disease, family issues and a brief scene with attempted sexual assault – but overall I really, really felt the fluff. I loved how Angie got roped up in Ten en Nev’s lives, found her spot and ended up making them better people. In return, they pretty much did the same for her. The relationship Angie has with her mom is also one I admire. They struggle through some things, but in the end they prove what a mother-daughter relationship should be about. Love and support. I wonder if you’re ever truly ready to face your greatest fear. I absolutely adored Nev. Being only twelve, she definitely has her childish moments, but overall she comes across as pretty grown-up. Makes sense with the life she’s had so far. The relationship she has with her brother, Ten, is a fun one to watch as well. They’re protective of each other, yet still know how to push the other’s buttons. Guess it wouldn’t be a brother-sister relationship otherwise, right? The general focus of Harshville is definitely on Angie’s passion for singing. With me being a sucker for anything dance- or music-related in books, I was bound to enjoy this aspect of the story and it didn’t disappoint! Assumptions are forgiveable. Intentionally degrading someone. That’s unforgivable. There is one very minor issue though. Actually one in particular and that’s Ten and Angie getting too close too fast for my liking. Ten starts out as the typical brooding, mysterious type and then there’s this.. sudden switch he makes where it all changes. I feel like it should’ve happened more gradually at least. That would’ve made me one happy person! This is definitely an enjoyable story to pick up when you want something fluffy and easy to read. It’s a quick read, with some fun twists and overall very likable characters! How do you feel about music / dance in contemporary books? Your cup of tea? Or do you prefer something else entirely? Are you going to keep an eye out for this book once 2020 is upon us? Quotes are taking from an uncorrected proof and will likely not be the same as the finished copy which will be published in 2020. I have this on my TBR on Swoon Reads, I guess I should check it out sooner than later. I really like the title. Fluff with a touch of heavy mixed in, sounds pretty good to me.